The application “Sag’s Wien” was developed in 2017. It serves to forward traffic problems and incidents directly to the municipal department of Vienna. In February it was awarded the eAward. What does “Sag’s Wien” do? The application was developed in cooperation with citizens of Vienna. It was part of the Digital Agenda Vienna. The goal was to build a network between citizens and the city administration in order to make life in Vienna more comfortable. Incidents or any traffic obstructions can be easily reported by citizens with the app. After an automatic check, if the issue has already been reported, the notice is immediately published. Other users are informed about the incident and the “Sag’s Wien”-service team takes care about the issues immediately. The “Sag’s Wien”-app is available for free on the App Store and Google Play. It is really user friendly. If one encounters any sort of problem in traffic, one can easily publish a notice with information and a picture of the issue. After a short data check the notice is published automatically. If this certain incident has already been reported, one can support it and add additional information. Registration on the app is not necessary, but it allows to create a personal profile. The app informs about current traffic incidents – they are enlisted and there is the possibility of seeing the issue on the city map. In that way, one is always informed about incidents and everyone can report issues themselves, in order to make life in Vienna easier. 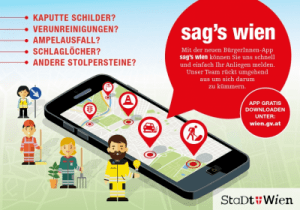 Since February 2017 the “Sag’s Wien”-app simplifies life in Vienna. It improves networking between citizens and the city administration and facilitates life in the city. In January 2018 “Sag’s Wien” was awarded the eAward in the category E-Government. The application is constantly being improved, in order to keep communal life pleasant in the future.